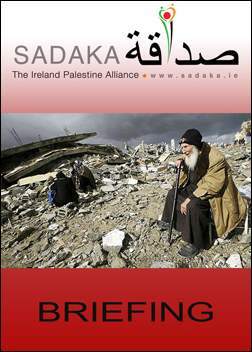 "The IDF targeted residential buildings and properties during the last few days of the crisis, with some reports estimating that a total of 382 residences were destroyed or sustained severe damages due to Israeli attacks (p6) ... On 18 November, an Israeli air strike without prior warning hit a three-storey house belonging to the Al-Dalou family in Al-Nasser neighbourhood, central Gaza City. The airstrike killed 12 people, five of whom were children and four were women. Ten of those killed belonged to one family (p6) ... 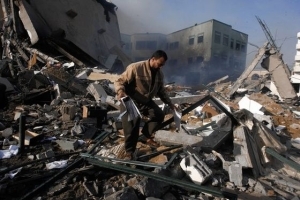 In a similar case, on 19 November an Israeli airstrike hit a four-story house belonging to the Azzam family in Al-Shojayaa, east of Gaza City. This airstrike killed four persons, two women and two children, and injured at least 25 civilians, including 22 children (p7)". 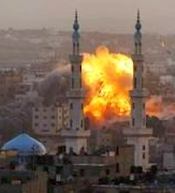 "On 17 November, a woman was killed by a missile while she was at home in Khuzaa, east of Khan Younis. 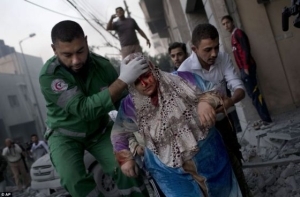 On 18 November in Al-Shojaaya, east of Gaza City, a rocket hit a house killing a 19-year-old woman and seriously injuring her mother. A further three people who were in the area when the attack occurred were killed, while at least 14 people, including five children, were injured. The targeted house is located in a heavily populated area that is also full of commercial activities. On 19 November, a father and his two children were killed when an Israeli missile hit their house, which was located in the centre of Jabalia, north of Gaza City. Seven members of the same family were injured. 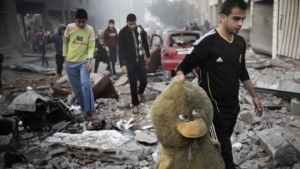 Also on 19 November, an airstrike hit a house east of Rafah City, southern Gaza Strip, killing one child and one adult. In these four cases, the houses were either completely destroyed or sustained serious damages, and no advance warning was given. 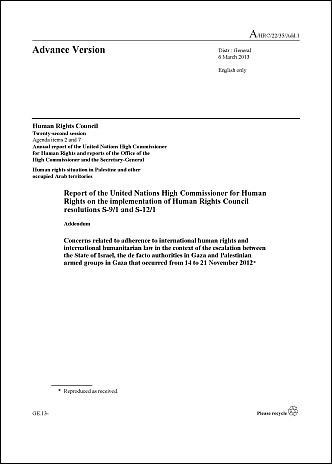 OHCHR, while gathering information, was not able to identify any military objective that the IDF might have had in these cases, thus raising concerns with regard to possible violations of the principle of distinction and potentially also the right to life." 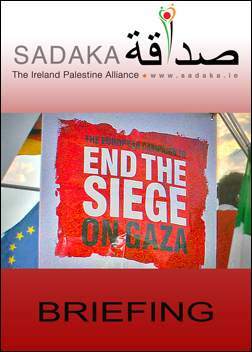 The truce officially came into effect at 1900 hours on the 21st November 2012, however Ma’an News reported further deadly airstrikes across the Gaza Strip. Around 1930 an unmanned drone slammed into Deir al-Balah in the central Gaza Strip killing a teenager and critically injuring another. 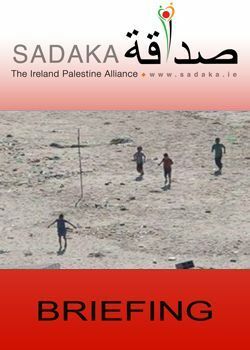 Medical sources identified the teenager as 14-year-old Nadir Abu Mugheiseeb. 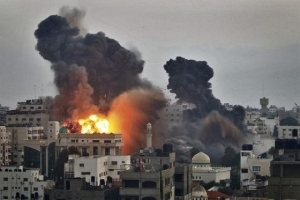 The eight day Israeli bombardment of the Gaza Strip has killed around 174 Palestinians and injured over 1,000 men, women and children. 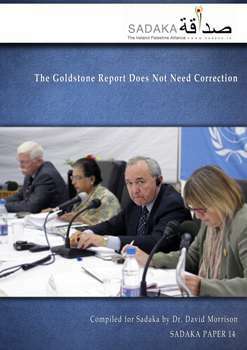 As for the ‘understanding’ itself, it is essentially the same as the June 2008 ‘understanding’, also brokered by Egypt, which Hamas implemented faithfully. 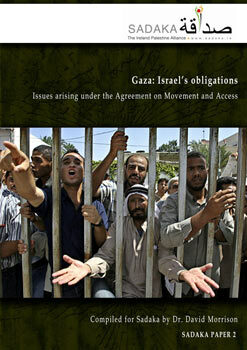 As a result, southern Israel was almost entirely free from firing out of Gaza for the following four and a half months, until Israel broke the understanding on 4 November 2008, when the world was watching the election of Barack Obama. 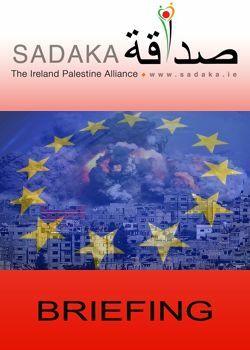 In other words, the approx 2,000 Palestinian deaths in Operation Cast Lead, in the intervening years, and in recent days in Operation Pillar of Cloud – has done nothing other than restore the status quo which preceded the 4th November 2008. 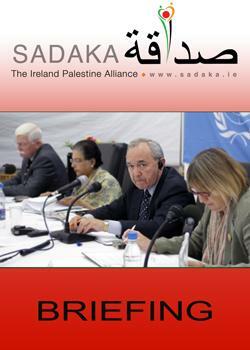 The lives that have been lost and the utter devastation that has been caused to Gaza – again – could all have been prevented had the international community acted in the intervening years. How many deaths does it take before lessons are learned? 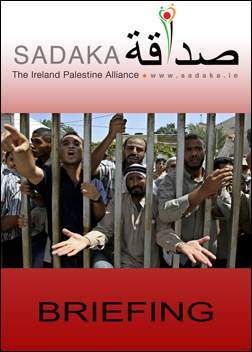 "No country in the world could get away so easily with slaughter, destruction and repression as the Israeli government has committed and is committing in Gaza and the West Bank: the blockade of Gaza, the hundreds of checkpoints in the West Bank, the illegal wall built within Palestinian territory on the West Bank, the illegal Jewish settlements - inhabited by half a million - which are entangled almost inextricably on the West Bank, the driving of Palestinians out of Jerusalem so that their population in that city has been amputated exponentially. The world does nothing about these crimes, daunted by the cynical Israeli exploitation of continuing guilt about the slaughter of Jews in the Holocaust." 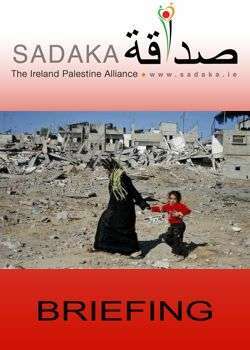 "There is no justification for the State of Gaza being able to shoot at our towns with impunity. 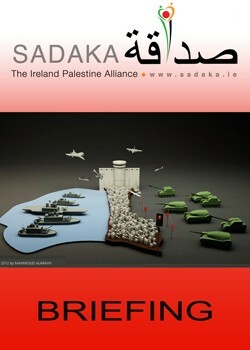 We need to flatten entire neighborhoods in Gaza. 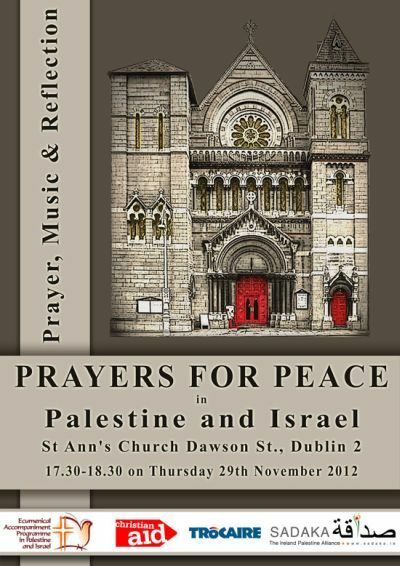 Flatten all of Gaza. The Americans didn’t stop with Hiroshima – the Japanese weren’t surrendering fast enough, so they hit Nagasaki, too". 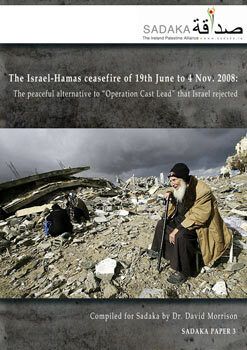 Dissecting IDF propaganda: The numbers behind the rocket attacks (Phan Nguyen, Mondoweiss, 17 November 2012) " Total fatalities in the history of rocket and mortar attacks from Gaza into Israel: 26"
Israel’s Minister of Home Front Defense, Avi Dichter, called for Israel to "reformat Gaza" to wipe it clean like a computer hard drive, except using bombs. Transport minister, Israel Katz, called for Israel to "bomb Gaza so hard that the population would flee into Egypt, and for Israel to cut off water and electricity supplies." 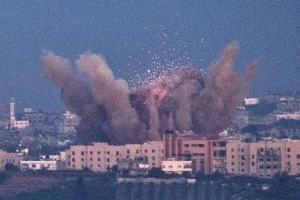 Eli Yishai, the Interior Minister and the head of the Shas party said the goal of the current assault is "to send Gaza back to the Middle Ages". According to the The Times of Israel, this is why so many Palestinian children are getting killed, its nothing to do with indiscriminate bombing and shelling by Israel! 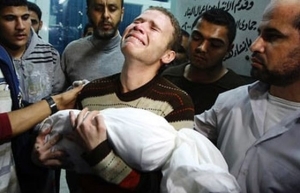 "If it seems like every time Israel drops a bomb on Gaza a child ends up dead, that is because there are a lot of children in Gaza" (Why children are getting killed in Gaza, The Times of Israel, 16 November 2012). 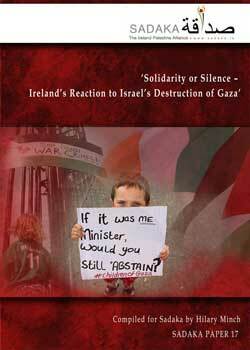 Gaza: Why did 3000 have to die?